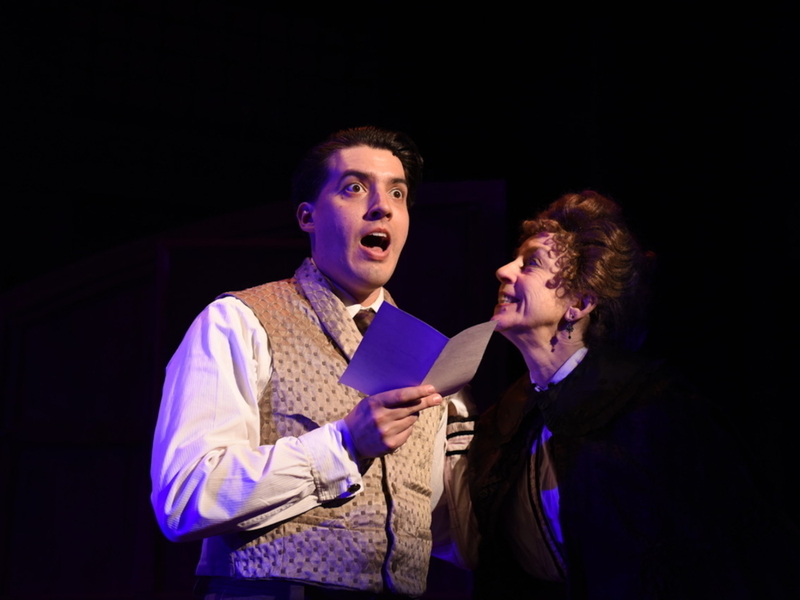 Review “A Gentleman’s Guide to Love and Murder” (Porchlight Music Theatre): Bloody Brilliant! 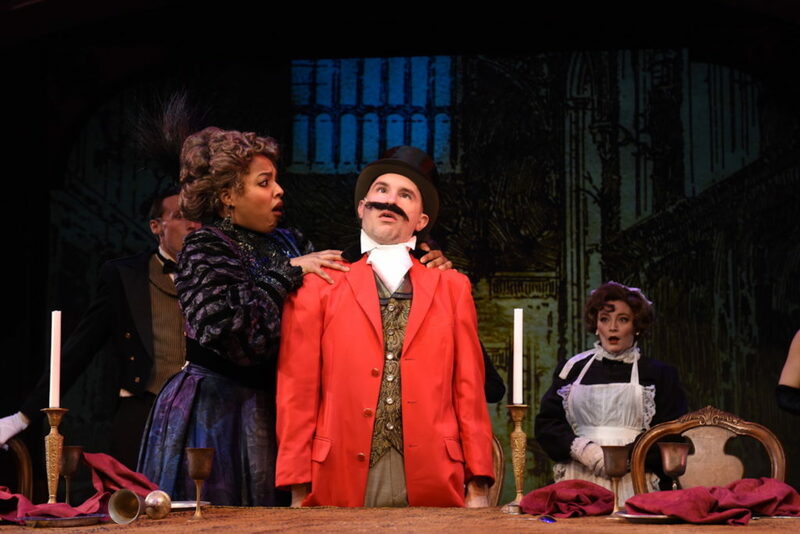 Porchlight Music Theatre presents A GENTLEMAN’S GUIDE TO LOVE AND MURDER. Is it more a comedy or a musical? It’s an extraordinary combination of both. Robert L. Freedman (book and lyrics) and Steven Lutvak (music and lyrics) create a witty and clever killer’s confession. Based on Roy Horniman’s novel, Freedman and Lutvak tell the story of a gentleman’s murderous rampage to secure his family’s title and fortune. Monty (played by Andres Enriques) narrates this play as his personal memoirs. Enriques’ tongue and cheek delivery is hysterical. He chronicles the body count, his lineage ascent and his sexual conquests with the same level of posh sophistication. Enriques is not so much a cold-blooded villain as an elegant anti-hero. He is an assassin but we can’t help but root for him to triumph over the establishment. And he doesn’t have A nemesis. He has an entire family of nemeses and Matt Crowle plays them all! 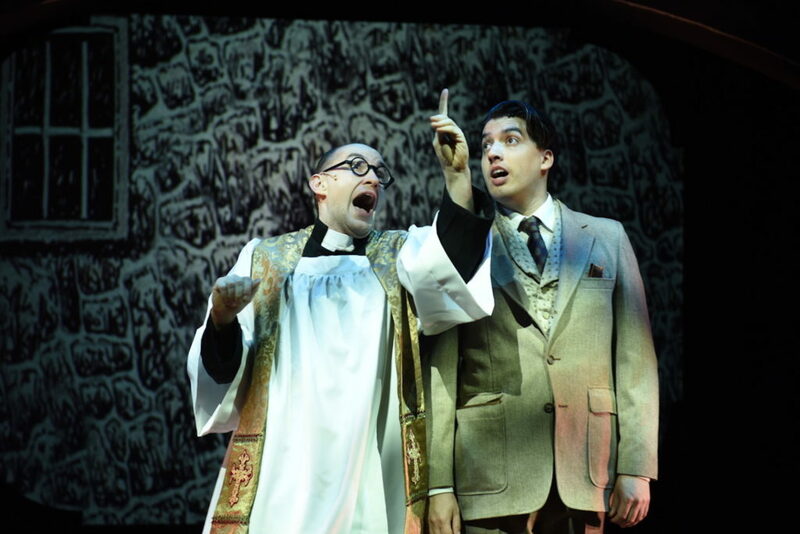 Crowle is a comedic tour de force! He plays nine distinct characters. As Enriques shares his slaughtering remembrances, Crowle pops up in the reenactment to be killed again. Crowle plays the out-of-breath minister, the cocky weight lifter, the bad actress, the spoiled son, the lady philanthropist, etc. He transitions quickly with the aid of a mustache, wig or muscle padding into a whole new persona. His chameleon skill is transfixing. His comedy is deadly sharp. 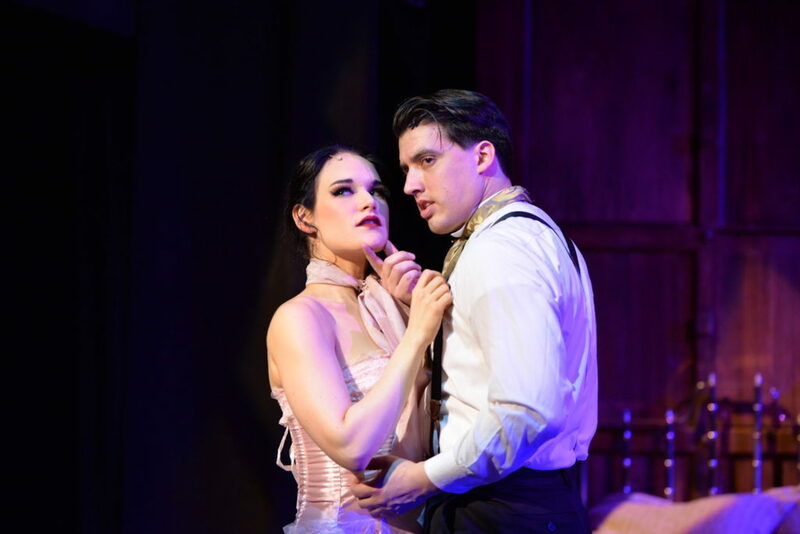 Stephen Schellhardt, director and choreographer, masterfully orchestrates this inside-out whodunit. Not only are his two male leads rock solid, his entire cast is superb. 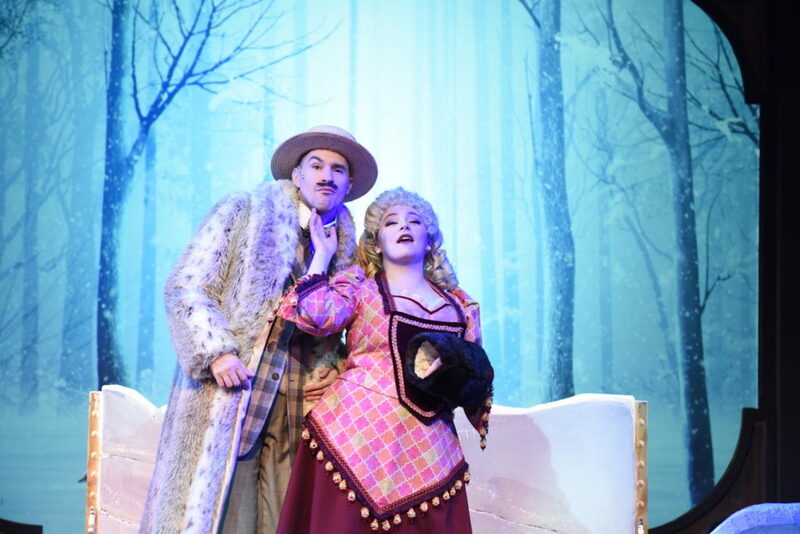 Emily Goldberg (Sibella) is wickedly funny in her unapologetic hedonistic quest. The lovely Ann Delaney (Phoebe) plays Betty to Goldberg’s Veronica. Yet when the duo sing That Horrible Woman, they each claim diva status for their powerhouse singing. Another standout is Sharriese Hamilton (Lady Eugenia) taking on Crowle in a hilarious dinner argument. The show is an ongoing chortle-fest. The only bad part is potentially missing the next joke because you are laughing so hard. And nod out to the creative team! 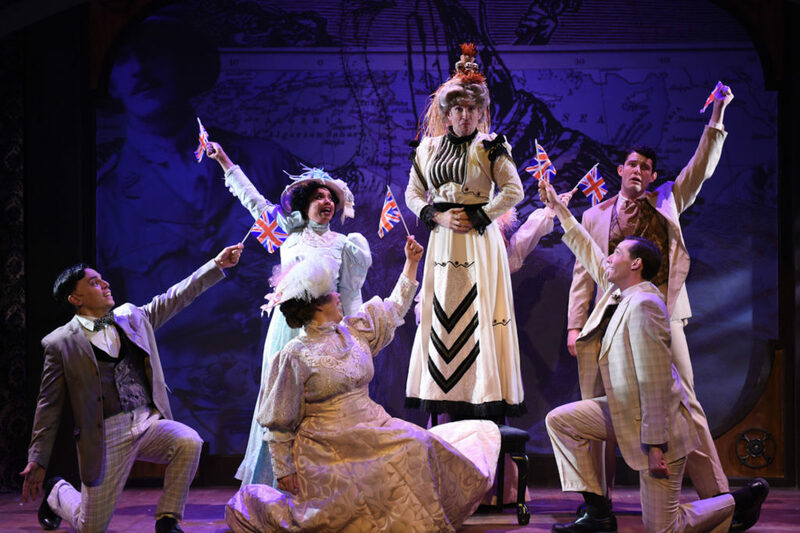 Costume Designer Jeff Hendry provides a stylish 1900s London fashion spectacle. My favorite is when the cast is decked out in exquisite funeral garb and sunglasses for Why Are All the D’Ysquith’s Dying. Angela Weber Miller (scenic) and Anthony Churchill (projections) combine forces to aid the madcap shenanigans. I especially like the projected visual of the terrific orchestra during the curtain call. Well done! A GENTLEMAN’S GUIDE TO LOVE & MURDER is bloody brilliant! It is equal parts lampoon and harmony. At the end of the show, my friend Carrie, a Broadway theatre goer, asked me in delighted surprise, ‘These are all Chicago actors?’ ‘YES!’ was my emphatic response. Porchlight Music Theatre is a sure bet for a fantastic musical experience.